As a start, I have selected this as a substantial logical work on the “CO2 theory”. Certainly I need to go deeper and look at the IPCC story, some which is now below. Just how much of the “Greenhouse Effect” is caused by human activity? It is about 0.28%, if water vapor is taken into account– about 5.53%, if not. This point is so crucial to the debate over global warming that how water vapor is orisn’t factored into an analysis of Earth’s greenhouse gases makes the difference between describing a significant human contribution to the greenhouse effect, or a negligible one. Water vapor constitutes Earth’s most significant greenhouse gas, accounting for about 95% of Earth’s greenhouse effect (5). Interestingly, many “facts and figures’ regarding global warming completely ignore the powerful effects of water vapor in the greenhouse system, carelessly (perhaps, deliberately) overstating human impacts as much as 20-fold. Water vapor is 99.999% of natural origin. Other atmospheric greenhouse gases, carbon dioxide (CO2), methane (CH4), nitrous oxide (N2O), and miscellaneous other gases (CFC’s, etc. ), are also mostly of natural origin (except for the latter, which is mostly anthropogenic). Human activites contribute slightly to greenhouse gas concentrations through farming, manufacturing, power generation, and transportation. However, these emissions are so dwarfed in comparison to emissions from natural sources we can do nothing about, that even the most costly efforts to limit human emissions would have a very small– perhaps undetectable– effect on global climate. For those interested in more details a series of data sets and charts have been assembled below in a 5-step statistical synopsis. Note that the first two steps ignore water vapor. Note: Calculations are expressed to 3 significant digits to reduce rounding errors, not necessarily to indicate statistical precision of the data. All charts were plotted using Lotus 1-2-3. Caveat: This analysis is intended to provide a simplified comparison of the various man-made and natural greenhouse gases on an equal basis with each other. It does not take into account all of the complicated interactions between atmosphere, ocean, and terrestrial systems, a feat which can only be accomplished by better computer models than are currently in use. 1. The following table was constructed from data published by the U.S. Department of Energy (1) summarizing concentrations of the various atmospheric greenhouse gases, and supplemented with information from other sources (2-7). Because some of the concentrations are very small the numbers are stated in parts per billion. DOE chose to NOT show water vapor as a greenhouse gas! The chart at left summarizes the % of greenhouse gas concentrations in Earth’s atmosphere from Table 1. This is not a very meaningful view though because 1) the data has not been corrected for the actual Global Warming Potential (GWP) of each gas, and 2) water vapor is ignored. Man-made and natural carbon dioxide (CO2) comprises 99.44% of all greenhouse gas concentrations (368,400 / 370,484 )–(ignoring water vapor). Anthropogenic (man-made) CO2 additions comprise (11,880 / 370,484) or 3.207% of all greenhouse gas concentrations, (ignoring water vapor). Total combined anthropogenic greenhouse gases comprise(12,217 / 370,484) or 3.298% of all greenhouse gas concentrations, (ignoring water vapor). The various greenhouse gases are not equal in their heat-retention properties though, so to remain statistically relevant % concentrationsmust be changed to % contributionrelative to CO2. This is done in Table 2, below, through the use of GWP multipliers for each gas, derived by various researchers. NOTE: GWP (Global Warming Potential) is used to contrast different greenhouse gases relative to CO2. Total carbon dioxide (CO2) contributions are reduced to 72.37% of all greenhouse gases (368,400 / 509,056)– (ignoring water vapor). Anthropogenic (man-made) CO2 contributions drop to (11,880 / 509,056) or 2.33% of total of all greenhouse gases, (ignoring water vapor). Total combined anthropogenic greenhouse gases becomes(28,162 / 509,056) or 5.53% of all greenhouse gas contributions,(ignoring water vapor). Relative to carbon dioxide the other greenhouse gases together comprise about 27.63% of the greenhouse effect (ignoring water vapor) but only about 0.56% of total greenhouse gas concentrations. Put another way, as a group methane, nitrous oxide (N2O), and CFC’s and other miscellaneous gases are about 50 times more potent than CO2 as greenhouse gases. To properly represent the total relative impacts of Earth’s greenhouse gases Table 3 (below) factors in the effect of water vapor on the system. 3. Table 3, shows what happens when the effect of water vapor is factored in, and together with all other greenhouse gases expressed as a relative % of the total greenhouse effect. As illustrated in this chart of the data in Table 3, the combined greenhouse contributions of CO2, methane, N2O and misc. gasesare small compared to water vapor! Total atmospheric carbon dioxide (CO2) — both man-made and natural– is only about 3.62% of the overall greenhouse effect— a big difference from the 72.37% figure in Table 2, which ignored water! Water vapor, the most significant greenhouse gas, comes from natural sources and is responsible for roughly 95% of the greenhouse effect (5). Among climatologists this is common knowledge but among special interests, certain governmental groups, and news reporters this fact is under-emphasized or just ignored altogether. Conceding that it might be “a little misleading” to leave water vapor out, they nonetheless defend the practice by stating that it is “customary” to do so! 4. Of course, even among the remaining 5% of non-water vapor greenhouse gases, humans contribute only a very small part (and human contributions to water vapor are negligible). Constructed from data in Table 1, the charts (below) illustrate graphically how much of each greenhouse gas is natural vs how much is man-made. These allocations are used for the next and final step in this analysis– total man-made contributions to the greenhouse effect. Units are expressed to 3 significant digits in order to reduce rounding errors for those who wish to walk through the calculations, not to imply numerical precision as there is some variation among various researchers. add up to about 0.28% of thegreenhouse effect. 5. To finish with the math, by calculating the product of the adjusted CO2 contribution to greenhouse gases (3.618%) and % of CO2 concentration from anthropogenic (man-made) sources (3.225%), we see that only (0.03618 X 0.03225) or 0.117% of the greenhouse effect is due to atmospheric CO2 from human activity. The other greenhouse gases are similarly calculated and are summarized below. When greenhouse contributions are listed by source, the relative overwhelming component of the natural greenhouse effect, is readily apparent. From Table 4a, both natural and man-made greenhouse contributions are illustrated in this chart, in gray and green, respectively. For clarity only the man-made (anthropogenic) contributions are labeled on the chart. Water vapor, responsible for 95% of Earth’s greenhouse effect, is 99.999% natural (some argue, 100%). Even if we wanted to we can do nothing to change this. Anthropogenic (man-made) CO2 contributions cause only about 0.117% of Earth’s greenhouse effect, (factoring in water vapor). This is insignificant! Adding up all anthropogenic greenhouse sources, the total human contribution to the greenhouse effect is around 0.28%(factoring in water vapor). The Kyoto Protocol calls for mandatory carbon dioxide reductions of 30% from developed countries like the U.S. Reducing man-made CO2 emissions this much would have an undetectable effect on climate while having a devastating effect on the U.S. economy. Can you drive your car 30% less, reduce your winter heating 30%? Pay 20-50% more for everything from automobiles to zippers? And that is just a down payment, with more sacrifices to come later. This is much less than the natural variability of Earth’s climate system! While the greenhouse reductions would exact a high human price, in terms of sacrifices to our standard of living, they would yield statistically negligible results in terms of measurable impacts to climate change. There is no expectation that any statistically significant global warming reductions would come from the Kyoto Protocol. Scientists are increasingly recognizing the importance of water vapor in the climate system. Some, like Wallace Broecker, a geochemist at Columbia’s Lamont-Doherty Earth Observatory, suggest that it is such an important factor that much of the global warming in the last 10,000 years may be due to the increasing water vapor concentrations in Earth’s atmosphere. His research indicates that air reaching glaciers during the last Ice Age had less than half the water vapor content of today. Such increases in atmospheric moisture during our current interglacial period would have played a far greater role in global warming than carbon dioxide or other minor gases. spring meeting in Baltimore, Md., May 1996. Known causes of global climate change, like cyclical eccentricities in Earth’s rotation and orbit, as well as variations in the sun’s energy output, are the primary causes of climate cycles measured over the last half million years. However, secondary greenhouse effects stemming from changes in the ability of a warming atmosphere to support greater concentrations of gases like water vapor and carbon dioxide also appear to play a significant role. As demonstrated in the data above, of all Earth’s greenhouse gases, water vapor is by far the dominant player. The ability of humans to influence greenhouse water vapor is negligible. As such, individuals and groups whose agenda it is to require that human beings are the cause of global warming must discount or ignore the effects of water vapor to preserve their arguments, citing numbers similar to those in Table 4b . If political correctness and staying out of trouble aren’t high priorities for you, go ahead and ask them how water vapor was handled in their models or statistics. Chances are, it wasn’t! Stoke Orchard, Cheltenham, Gloucestershire, GL52 7RZ, United Kingdom. Chemical formulae and global warming potentials from Intergovernmental Panel on Climate Change, Climate Change 1995: The Science of Climate Change (Cambridge, UK: Cambridge University Press, 1996), pp. 119 and 121. Production and sales of CFC’s and other chemicals from International Trade Commission, Synthetic Organic Chemicals: United States Production and Sales, 1994 (Washington, DC, 1995). TRI emissions from U.S. Environmental Protection Agency, 1994 Toxics Release Inventory: Public Data Release, EPA-745-R-94-001 (Washington, DC, June 1996), p. 73. Estimated 1994 U.S. emissions from U.S. Environmental Protection Agency, Inventory of U.S. Greenhouse Gas Emissions and Sinks, 1990-1994, EPA-230-R-96-006 (Washington, DC, November 1995), pp. 37-40.
g. Does CO2 Really Drive Global Warming? As a follow up, a bit hasty, but it showed up on the same internet search as the above post, and seemed to be a relevant balance to the debate. Yet, in reading it briefly, I hope for the sake of the IPCC that I can find something more convincing than this. It is pathetic! Better not make hasty judgments. Frequently Asked Question 1.3: What is the Greenhouse Effect? The Sun powers Earth’s climate, radiating energy at very short wavelengths, predominately in the visible or near-visible (e.g., ultraviolet) part of the spectrum. Roughly one-third of the solar energy that reaches the top of Earth’s atmosphere is reflected directly back to space. The remaining two-thirds is absorbed by the surface and, to a lesser extent, by the atmosphere. To balance the absorbed incoming energy, the Earth must, on average, radiate the same amount of energy back to space. 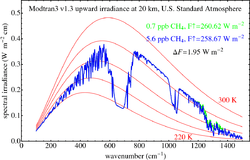 Because the Earth is much colder than the Sun, it radiates at much longer wavelengths, primarily in the infrared part of the spectrum (see Figure 1). Much of this thermal radiation emitted by the land and ocean is absorbed by the atmosphere, including clouds, and reradiated back to Earth. This is called the greenhouse effect. FAQ 1.3, Figure 1. An idealised model of the natural greenhouse effect. See text for explanation. The glass walls in a greenhouse reduce airflow and increase the temperature of the air inside. Analogously, but through a different physical process, the Earth’s greenhouse effect warms the surface of the planet. Without the natural greenhouse effect, the average temperature at Earth’s surface would be below the freezing point of water. Thus, Earth’s natural greenhouse effect makes life as we know it possible. However, human activities, primarily the burning of fossil fuels and clearing of forests, have greatly intensified the natural greenhouse effect, causing global warming. NOTE: Interesting that it notes that H2O “swamps” CO2 in the tropics, but stresses that CO2 is the predominant GHG at the poles. (where solar input is minimum and CO2 greenhouse heating relatively high, but surely minimal overall. Heat transfer around the globe becomes an issue and the relative warmer than “would otherwise be” at the poles might have “global warming” influence). More to be assessed! At the moment I am prepared to go out on my limb and suggest that the IPCC theory, as given here, is never going to win a scientific peer review of any quality. All the AGW blogging supporters, including scientists are standing the high ground saying they are strongly supported by science. Well it better get better than this! All observed evidence from measurements all over the earth show with overwhelming evidence that humans are causing the bulk of the increase of CO2 into the atmosphere. That humans are the cause of the recent increase of CO2 doesn’t tell anything about the influence of increased CO2 on temperature! In climate science, radiative forcing is loosely defined as the change in net irradiance at atmospheric boundaries between different layers of the atmosphere, namely the troposphere and the stratosphere (the tropopause). Net irradiance is the difference between the incoming radiation energy and the outgoing radiation energy in a given climate system and is measured in Watts per square meter. The change is computed based on “unperturbed” values, defined by the Intergovernmental Panel on Climate Change (IPCC) as the measured difference relative to a base period. For radiative forcings for the industrial era, it is customary to take the year 1750 as the starting point. A positive forcing (more incoming energy) tends to warm the system, while a negative forcing (more outgoing energy) tends to cool it. Possible sources of radiative forcing are changes in insolation (incident solar radiation), or the effects of variations in the amount of radiatively active gases and aerosols present. Because the IPCC regularly assesses the radiative forcing, it also has a more specific technical definition – see “IPCC usage” section. The vast majority of the energy which affects Earth’s weather comes from the Sun. The planet and its atmosphere absorb and reflect some of the energy, while long-wave energy is radiated back into space. The balance between absorbed and radiated energy determines the average temperature. The planet is warmer than it would be in the absence of the atmosphere: see greenhouse effect. The radiation balance can be altered by factors such as intensity of solar energy, reflection by clouds or gases, absorption by various gases or surfaces, emission of heat by various materials, and other factors related to climate change. Any such alteration is a radiative forcing, and causes a new balance to be reached. In the real world this happens continuously as sunlight hits the surface, clouds and aerosols form, the concentrations of atmospheric gases vary, and seasons alter the ground cover. 2005 radiative forcings as estimated by the IPCC. The radiative forcing of the surface-troposphere system due to the perturbation in or the introduction of an agent (say, a change in greenhouse gas concentrations) is the change in net (down minus up) irradiance (solar plus long-wave; in Wm-2) at the tropopause AFTER allowing for stratospheric temperatures to readjust to radiative equilibrium, but with surface and tropospheric temperatures and state held fixed at the unperturbed values. In simple terms, radiative forcing is “…the rate of energy change per unit area of the globe as measured at the top of the atmosphere.” In the context of climate change, the term “forcing” is restricted to changes in the radiation balance of the surface-troposphere system imposed by external factors, with no changes in stratospheric dynamics, no surface and tropospheric feedbacks in operation (i.e., no secondary effects induced because of changes in tropospheric motions or its thermodynamic state), and no dynamically induced changes in the amount and distribution of atmospheric water (vapour, liquid, and solid forms). Radiative forcing (often measured in watts per square meter) can be estimated in different ways for different components. For the case of a change in solar irradiance, the radiative forcing is the change in the solar constant divided by 4 and multiplied by 0.7 to take into account the geometry of the sphere and the amount of reflected sunlight. For a greenhouse gas, such as carbon dioxide, radiative transfer codes that examine each spectral line for atmospheric conditions can be used to calculate the change ΔF as a function of changing concentration. These calculations can often be simplified into an algebraic formulation that is specific to that gas. where C is the CO2 concentration in parts per million by volume and C0 is the reference concentration. The relationship between carbon dioxide and radiative forcing is logarithmic so that increased concentrations have a progressively smaller warming effect. Formulas for other greenhouse gases such as methane, N2O or CFCs are given in the IPCC reports. Radiative forcing is intended as a useful way to compare different causes of perturbations in a climate system. Other possible tools can be constructed for the same purpose: for example Shine et al. say “…recent experiments indicate that for changes in absorbing aerosols and ozone, the predictive ability of radiative forcing is much worse… we propose an alternative, the ‘adjusted troposphere and stratosphere forcing’. We present GCM calculations showing that it is a significantly more reliable predictor of this GCM’s surface temperature change than radiative forcing. It is a candidate to supplement radiative forcing as a metric for comparing different mechanisms…”. In this quote, GCM stands for “global circulation model”, and the word “predictive” does not refer to the ability of GCMs to forecast climate change. Instead, it refers to the ability of the alternative tool proposed by the authors to help explain the system response. ^ Rockstrom, Johan; Steffen, Will; Noone, Kevin; Persson, Asa; Chapin, F. Stuart; Lambin, Eric F.; et al., TM; Scheffer, M et al. (2009). “A safe operating space for humanity”. Nature 461 (7263): 472–475. doi:10.1038/461472a. PMID 19779433. Intergovernmental Panel on Climate Change’s Fourth Assessment Report (2007), Chapter 2, “Changes in Atmospheric Constituents and Radiative Forcing,” pp. 133–134 (PDF, 8.6 MB, 106 pp.). NOAA/ESRL Global Monitoring Division (no date), The NOAA Annual Greenhouse Gas Index. Calculations of the radiative forcing of greenhouse gases. A study by GISS climate scientists recently published in the journal Science shows that atmospheric CO2 operates as a thermostat to control the temperature of Earth. There is a close analogy to be drawn between the way an ordinary thermostat maintains the temperature of a house, and the way that atmospheric carbon dioxide (and the other minor non-condensing greenhouse gases) control the global temperature of Earth. The ordinary thermostat produces no heat of its own. Its role is to switch the furnace on and off, depending on whether the house temperature is lower or higher than the thermostat setting. If we were to carefully monitor the temperature of the house, we would see that the temperature does not stay constant at the set value, but rather exhibits a “natural variability” as the house temperature slips below the set value and then overshoots the mark with a time constant of minutes to tens of minutes, because of the thermal inertia of the house and because heating by the furnace (when it is on) is more powerful than the steady heat loss to the outdoors. If the thermostat is suddenly turned to a very high setting, the temperature will begin to rise at a rate dictated by the inertia of the house and strength of the furnace. Turning the thermostat back to normal will stop the heating. Figure 1. Attribution of individual atmospheric component contributions to the terrestrial greenhouse effect, separated into feedback and forcing categories. Dotted and dashed lines depict the fractional response for single-addition and single-subtraction of individual gases to either an empty or full-component reference atmosphere, respectively. Solid black lines are the scaled averages of the dashed and dotted line fractional response results. The sum of the fractional responses must add up to the total greenhouse effect. The reference model atmosphere is for 1980 conditions. Atmospheric carbon dioxide performs a role similar to that of the house thermostat in setting the equilibrium temperature of the Earth. It differs from the house thermostat in that carbon dioxide itself is a potent greenhouse gas (GHG) warming the ground surface by means of the greenhouse effect. It is this sustained warming that enables water vapor and clouds to maintain their atmospheric distributions as the so-called feedback effects that amplify the initial warming provided by the non-condensing GHGs, and in the process, account for the bulk of the total terrestrial greenhouse effect. Since the radiative effects associated with the buildup of water vapor to near-saturation levels and the subsequent condensation into clouds are far stronger than the equilibrium level of radiative forcing by the non-condensing GHGs, this results in large local fluctuations in temperature about the global equilibrium value. Together with the similar non-linear responses involving the ocean heat capacity, the net effect is the “natural variability” that the climate system exhibits regionally, and on inter-annual and decadal timescales, whether the global equilibrium temperature of the Earth is being kept fixed, or is being forced to re-adjust in response to changes in the level of atmospheric GHGs. This assessment comes about as the result of climate modeling experiments which show that it is the non-condensing greenhouse gases such as carbon dioxide, methane, ozone, nitrous oxide, and chlorofluorocarbons that provide the necessary atmospheric temperature structure that ultimately determines the sustainable range for atmospheric water vapor and cloud amounts, and thus controls their radiative contribution to the terrestrial greenhouse effect. From this it follows that these non-condensing greenhouse gases provide the temperature environment that is necessary for water vapor and cloud feedback effects to operate, without which the water vapor dominated greenhouse effect would inevitably collapse and plunge the global climate into an icebound Earth state. Within only the past century, the CO2 control knob has been turned sharply upward toward a much hotter global climate. The pre-industrial level of atmospheric carbon dioxide was about 280 ppm, which is representative of the interglacial maximum level of atmospheric CO2. During ice age extremes, the level of atmospheric CO2 drops to near 180 ppm, for which the global temperature is about 5 °C colder. The rapid recent increase in atmospheric CO2 has been attributed to human industrial activity, primarily the burning of fossil fuels. This has pushed atmospheric CO2 toward the 400 ppm level, far beyond the interglacial maximum. The climate system is trying to respond to the new setting of the global temperature thermostat, and this response has been the rise in global surface temperature by about 0.2 °C per decade for the past three decades. It has been suggested that we are well past the 300 to 350 ppm target level for atmospheric CO2 beyond which dangerous anthropogenic interference in the climate system would be expected to exceed the 25% risk tolerance for impending degradation of land and ocean ecosystems, sea level rise, and inevitable disruption of the socio-economic and food-producing infrastructure (Hansen et al. 2008). This prospect of a rising risk of triggering unacceptable environmental consequences makes reduction and control of atmospheric CO2 a serious and pressing issue for humanity, worthy of real time attention. Figure 2. Time evolution of global surface temperature, top-of-atmosphere (TOA) net flux, column water vapor, planetary albedo, sea ice cover, and cloud cover, after zeroing out all the non-condensing greenhouse gases. The model used in the experiment is the GISS 2°×2.5° AR5 version of ModelE with the climatological (Q-flux) ocean energy transport and the 250 m mixed layer depth. The model initial conditions are for a pre-industrial atmosphere. Surface temperature and TOA net flux utilize the left-hand scale. Radiative modeling analyses of the terrestrial greenhouse structure described in a parallel study in the Journal of Geophysical Research (Schmidt et al., 2010) found that water vapor accounts for about 50% of the Earth’s greenhouse effect, with clouds contributing 25%, carbon dioxide 20%, and the minor greenhouse gases (GHGs) and aerosols accounting for the remaining 5%, as shown in Fig. 1. Thus, while the non-condensing greenhouse gases account for only 25% of the total greenhouse effect, it is these non-condensing GHGs that actually control the strength of the terrestrial greenhouse effect since the water vapor and cloud feedback contributions are not self-sustaining and as such, only provide amplification. Because carbon dioxide accounts for 80% of the non-condensing GHG forcing in the current climate atmosphere, atmospheric carbon dioxide therefore qualifies as the principal control knob that governs the temperature of Earth. The numerical climate experiment described in Fig. 2. demonstrates the fundamental radiative forcing role of the non-condensing GHGs, and the feedback (only) role of water vapor and clouds. This climate modeling experiment was performed using the GISS ModelE general circulation coupled atmosphere-ocean climate model by zeroing out all of the non-condensing greenhouse gases. Doing this removed the radiative forcing that sustains the temperature support for water vapor and cloud feedbacks, causing rapid condensation and precipitation of water vapor from the atmosphere, collapsing the terrestrial greenhouse effect, and plunging the Earth into an icebound state. The scope of the climate impact becomes apparent in just 10 years. During the first year alone, global mean surface temperature falls by 4.6 °C. After 50 years, the global temperature stands at -21 °C, a decrease by 34.8 °C. Atmospheric water vapor is at ~10% of the control climate value (22.6 to 2.2 mm). Global cloud cover increases from its 58% control value to more than 75%; the global sea ice fraction goes from 4.6% to 46.7%, causing the planetary albedo of Earth to increase from ~29% to 41.8%. This has the effect to reduce the absorbed solar energy to further exacerbate the global cooling. After 50 years, one third of the ocean surface still remains ice-free, even though the global surface temperature is colder than -21 °C. At tropical latitudes, incident solar radiation is enough to keep the ocean from freezing. While this thermal oasis within an otherwise icebound Earth appears to be stable, at least on the short timescale illustrated, further calculations with an interactive ocean are needed to verify the potential for long-term stability. The surface temperatures in Fig. 3 are only marginally warmer than 1 °C within the remaining low latitude heat island. Figure 3. Zonally averaged annual-mean surface temperature change following the zeroing out of non-condensing greenhouse gases. From the foregoing, it is clear that CO2 is the key atmospheric gas that exerts principal control (80% of the non-condensing GHG forcing) over the strength of the terrestrial greenhouse effect. Water vapor and clouds are fast-acting feedback effects, and as such, they are controlled by the radiative forcing supplied by the non-condensing GHGs. The bottom line is that atmospheric carbon dioxide acts as a thermostat in regulating the temperature of Earth. The rapid increase in atmospheric carbon dioxide due to human industrial activity is therefore setting the course for continued global warming. Because of the large heat capacity of the climate system, the global surface temperature does not respond instantaneously to the sharp upturn of the carbon dioxide thermostat, which at this moment stands at 386.80 ppm compared to the normal interglacial maximum level of 280 ppm. Since humans are responsible for changing the level of atmospheric carbon dioxide, they then also have control over the global temperature of the Earth. Humans are at a difficult crossroad. Carbon dioxide is the lifeblood of civilization as we know it. It is also the direct cause fueling an impending climate disaster. There is no viable alternative to counteract global warming except through direct human effort to reduce the atmospheric CO2 level. The basic physics for the present study is rooted in the high precision measurements documenting the rise of atmospheric carbon dioxide and other greenhouse gases as fully described in the IPCC AR4 report, and in the comprehensive HITRAN database (Rothman et al. 2009) of atmospheric absorption data. The radiative transfer calculations involve well-understood physics that is applied to the global energy balance of the Earth, which is maintained by radiative processes only, since the global net energy transports must equal zero. This demonstrates the nature of the terrestrial greenhouse effect as being sustained by the non-condensing GHGs, with magnification of the greenhouse effect by water vapor and cloud feedbacks, and leaves no doubt that increasing GHGs cause global warming. The release of greenhouse gases and aerosols resulting from human activities are changing the amount of radiation coming into and leaving the atmosphere, likely contributing to changes in climate. Figure 1 – Carbon Dioxide: Click on Thumbnail for full size image Carbon dioxide (CO2) concentrations in the atmosphere increased from approximately 280 parts per million (ppm) in pre-industrial times to 382 ppm in 2006 according to the National Oceanic and Atmospheric Administration’s (NOAA) Earth Systems Research Laboratory, a 36 percent increase. Almost all of the increase is due to human activities (IPCC, 2007). The current rate of increase in CO2 concentrations is about 1.9 ppmv/year. Present CO2 concentrations are higher than any time in at least the last 650,000 years (IPCC, 2007). See Figure 1 for a record of CO2 concentrations from about 420,000 years ago to present. For more information on the human and natural sources of CO2 emissions, see the Emissions section and for actions that can reduce these emissions, see the What You Can Do Section. Figure 2 – Methane: Click on Thumbnail for full size image Methane (CH4) is more abundant in the Earth’s atmosphere now than at any time in at least the past 650,000 years (IPCC, 2007). Methane concentrations increased sharply during most of the 20th century and are now 148% above pre-industrial levels. In recent decades, the rate of increase has slowed considerably (see Figure 2). For more information on CH4 emissions and sources, and actions that can reduce emissions, see EPA’s Methane Site. Figure 3 – Nitrous Oxide: Click on Thumbnail for full size image Nitrous oxide (N2O) has increased approximately 18 percent in the past 200 years and continues to increase (see Figure 3). For about 11,500 years before the industrial period, the concentration of N2O varied only slightly. It increased relatively rapidly toward the end of the 20th century (IPCC, 2007). For more information on N2O emissions and sources, see EPA’s Nitrous Oxide Site . How are Greenhouse Gas Concentrations from Thousands of Years Ago Determined?Portions of the Antarctic ice sheet are several miles deep, consisting of ice that has accumulated over hundreds of thousands of years or longer. Paleoclimatologists (scientists who study the history of the Earth’s climate) drill holes in this ice to extract what are called “cylindrical cores,” or “ice cores.”Ice cores can provide valuable information about the Earth’s past. For example, the cores contain trapped air bubbles that can be analyzed to obtain snapshots of the composition of the atmosphere at the time the ice accumulated. Through this analysis, concentrations of greenhouse gases (CO2, CH4, N2O) dating back thousands of years or longer can be obtained with a high level of confidence. See the National Aeronautics and Space Administration’s (NASA) Earth Observatory feature “Paleoclimatogy: The Ice Core Method” for more information. Tropospheric ozone (O3) is created by chemical reactions from automobile, power plant and other industrial and commercial source emissions in the presence of sunlight. It is estimated that O3 has increased by about 36% since the pre-industrial era, although substantial variations exist for regions and overall trends (IPCC, 2007). Besides being a greenhouse gas, ozone can also be a harmful air pollutant at ground level, especially for people with respiratory diseases and children and adults who are active outdoors. Measures are being taken to reduce ozone emissions in the U.S. (through the Clean Air Act) and also in other countries. Chlorofluorocarbons (CFCs) and hydrochlorofluorocarbons (HCFCs) are used in coolants, foaming agents, fire extinguishers, solvents, pesticides and aerosol propellants. These compounds have steadily increased in the atmosphere since their introduction in 1928. Concentrations are slowly declining as a result of their phaseout via the Montreal Protocol on Substances that Deplete the Ozone Layer. Fluorinated gases such as hydrofluorocarbons (HFCs), perfluorocarbons (PFCs), and sulfur hexafluoride (SF6) are frequently used as substitutes for CFCs and HCFCs and are increasing in the atmosphere. These various fluorinated gases are sometimes called “high global warming potential greenhouse gases” because, molecule for molecule, they trap more heat than CO2. For more information, visit EPA’s High Global Warming Potential Gases Site. The burning of fossil fuels and biomass (living matter such as vegetation) has resulted in aerosol emissions into the atmosphere. Aerosols absorb and emit heat, reflect light and, depending on their properties, can either cool or warm the atmosphere. NASA’s Earth Observatory describes how aerosols can also affect how clouds form. Sulfate aerosols are emitted when fuel containing sulfur, such as coal and oil, is burned. Sulfate aerosols reflect solar radiation back to space and have a cooling effect. These aerosols have decreased in concentration in the past two decades resulting from efforts to reduce the coal-fired power plant emissions of sulfur dioxide in the United States and other countries. Black carbon (or soot) results from the incomplete combustion of fossil fuels and biomass burning (forest fires and land clearing) and is believed to contribute to global warming (IPCC, 2007). Though global concentrations are likely increasing, there are significant regional differences. In the United States and many other countries, efforts to reduce particulate matter (of which black carbon is a part) are lowering black carbon concentrations. Other aerosols emitted in small quantities from human activities include organic carbon and associated aerosols from biomass burning. Mineral dust aerosols (e.g., from deserts and lake beds) largely originate from natural sources, but their distribution can be affected by human activities. Radiative forcing is the change in the balance between solar radiation entering the atmosphere and the Earth’s radiation going out. On average, a positive radiative forcing tends to warm the surface of the Earth while negative forcing tends to cool the surface. Radiative forcing is measured in Watts per square meter, which is a measure of energy. For example, an increase in radiative forcing of +1 Watt per square meter is like shining one small holiday tree light bulb over every square meter of the Earth. The radiative forcing contribution (since 1750) from increasing concentrations of well-mixed greenhouse gases (including CO2, CH4, N2O, CFCs, HCFCs, and fluorinated gases) is estimated to be +2.64 Watts per square meter – over half due to increases in CO2 (+1.66 Watts per square meter), strongly contributing to warming relative to other climate components described below. The radiative forcing contribution from increasing tropospheric ozone, an unevenly distributed greenhouse gas, is estimated to be +0.35 Watts per square meter (on average), resulting in a relatively small warming effect. This forcing varies from region to region depending on the amount of ozone in the troposphere at a particular location. The radiative forcing contribution from the observed depletion of stratospheric ozone is estimated to be -0.05 Watts per square meter, resulting in a relatively small cooling effect. While aerosols can have either positive or negative contributions to radiative forcing, the net effect of all aerosols added to the atmosphere has likely been negative. The best estimate of aerosols’ direct cooling effect is -0.5 Watts per square meter; the best estimate for their indirect cooling effect (by increasing the reflectivity of clouds) is -0.7 Watts per square meter, with an uncertainty range of -1.8 to -0.3 Watts per square meter. Therefore, the net effect of changes in aerosol radiative forcing has likely resulted in a small to relatively large cooling effect. Land use change (including urbanization, deforestation, reforestation, desertification, etc) can have significant effects on radiative forcing (and the climate) at the local level by changing the reflectivity of the land surface (or albedo). For example, because farmland is more reflective than forests (which are strong absorbers of heat), replacing forests with farmland would negatively contribute to radiative forcing or have a cooling effect. Averaged over the Earth, the net radiative forcing contribution of land use changes, while uncertain, is estimated to be -0.2 Watts per square meter (IPCC, 2007), resulting in a relatively small cooling effect. Based on a limited, 25-year record, the effect of changes in the sun’s intensity on radiative forcing is estimated to be relatively small, or a contribution of about +0.12 Watts per square meter, resulting in a relatively small warming effect. 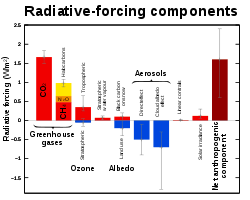 NOAA’s Annual Greenhouse Gas Index (AGGI), which tracks changes in radiative forcing from greenhouse gases over time, shows that radiative forcing from greenhouse gases has increased 21.5% since 1990 as of 2006. Much of the increase (63%) has resulted from the contribution of CO2. The contribution to radiative forcing by CH4 and CFCs has been nearly constant or declining, respectively, in recent years. How Is Radiative Forcing Determined?For well-mixed greenhouse gases, mathematical equations are used to compute radiative forcing based on changes in their concentration relative to 1750 (or 1990 for NOAA’s AGGI) and the known radiative properties of the gases. Confidence in these calculations is high due to reliable current and historic concentration data and well-established physics.Due to limited measurements and regional variation, changes in tropospheric ozone, aerosols, land use and the sun’s intensity are much more uncertain. In the case of aerosols, uncertainty is increased due to an incomplete understanding of how aerosols interact with clouds and the effects the interactions have on aerosol radiative forcing.For more information, see Working Group I’s contribution to the Intergovernmental Panel on Climate Change’s Fourth Assessment Report (2007), Chapter 2, “Changes in Atmospheric Constituents and Radiative Forcing,” pp. 133-134 (PDF, 8.6 MB, 106 pp.). Real Climate article: http://www.realclimate.org/index.php/archives/2004/11/water-vapour-feedback/— rasmus @ 28 November 2004 – ( )Water vapour act as a powerful greenhouse gas absorbing long-wave radiation. If the atmospheric water vapour concentration increases as a result of a global warming, then it is expected that it will enhance the greenhouse effect further. It is well known that the rate of evaporation is affected by the temperature and that higher temperatures increase the (saturated) vapour pressure (the Clausius-Clapeyron equation). This process is known as the water vapour feedback. One important difference between water vapour and other greenhouse gases such as CO2 is that the moisture spends only a short time in the atmosphere before being precipitated out, whereas the life time of CO2in the atmosphere may be longer than 100 years.Major logic errors: Life of H2O irrelevant as it recycles continuously, warmer the planet the higher the flow, higher the level. 2. If CO2 has long life it will climb higher but radiation increases decrease as concentration increases. There will be a sort of saturation. But it also recycles down at the surface. Higher the concentration the higher the uptake by plants, ocean. Related links:http://wattsupwiththat.com/2011/08/05/the-emily-litella-moment-for-climate-science-and-co2/#more-44593 Salby claim CO2 not preceeding temp. Any danger to humans? Not according to the Navy.